The latest edition of our newsletter, compiled by Morag T Fyfe, can be found on the Grave Matters page. Military pensioners in Glasgow in the 1840s. We know that a number of men buried in the Necropolis fought in the Peninsula War or at Waterloo; there are the Cruikshank brothers in Epsilon and Sergeant James Russell of the Scots Greys in Gamma. However, at the moment we are finding that a number of men being buried are described as ‘soldier’, ‘pensioner’, ‘pensioner, late of X Regt’ and it made me wonder whether any of them might be Waterloo veterans. Between 1834 and 1844 24 men have been found. Those listed simply as pensioners may not be Chelsea Pensioners though I do wonder where else their pensions might have come from. Those who are described simply as soldiers may still have been serving in the army when they died but this still leaves a group of 14 ex-soldiers some of whom were awarded pensions when they left the army. Ignoring the five officers at the moment I was left with nine names. A quick search of the Waterloo Medal Roll showed that none of the men could be identified there but I may have managed to find the service records of four of them in the other online military records at Ancestry and Find my Past. It can be a problem being sure that one has found the correct records but I am reasonably confident that, in this case, I have identified the correct John Pollock who was buried in the Necropolis on 17th October 1842. This John Pollock, agent and house factor late of 90th Regt was buried in Eta 16, the only one of the sample not to be buried in a Single Grave. His age was given as 51 from which one can estimate his year of birth as 1790-1791. His service records show John Pollock joined the 90th Regiment at Glasgow in 1807 at the age of 18 and was discharged from Haslar Barracks, Gosport in 1831 as a colour sergeant. When he left the regiment he was the Pay-Sergeant for his company which suggests a certain level of education and probably explains why he was able for find employment as an agent and house factor when he returned to civilian life. His service is listed as six years in the West Indies where he was present at the surrender of Guadeloupe by the French in 1810, one year in North America [Canada], six months in France and three years in the Mediterranean. When Pollock enlisted in 1807 the 90th was already in the West Indies stationed on Saint Vincent and Pollock arrived there on 9th July 1808. The regiment left for Canada on 20th June 1814 and moved from there to Ostend in August 1815 to form part of the Army of Occupation of France; thus Pollock missed participating in the Battle of Waterloo by two months. The regiment spent 1820-1830 in the Mediterranean but Pollock only spent three years there and the reason becomes clear when one reads about his medical state. Before being discharged he had to go before a medical board who certified that he was suffering from ‘hepatic disease’ and chronic rheumatism. His ill health was agreed to stem from a ‘protracted attack of remittent fever at Zante in 1824’. Zante, or Zakynthos is one of the Ionian Islands where the regiment arrived in 1821. Remittent fever is a symptom, not a disease in itself so it is impossible to know for sure what Pollock was suffering from but malaria or typhoid fever may be likely. Bearing in mind Pollock only served in the Mediterranean for three years it looks as though he returned to Britain after his illness in 1824. There is no longer a gravestone on Eta 16 but the burial registers record the burial of Margaret Wright, relict of John Pollock in 1843. 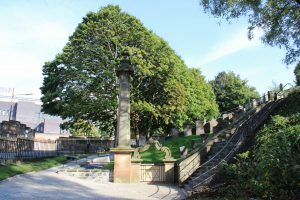 On the 31st October 1843 William Adam of Milnbank Bleachfield was buried in the Necropolis. His coffin was originally placed in the Egyptian Vaults until his grave in Kappa was ready. On reading this entry I wondered where this bleachfield was and assumed it was probably south of Glasgow near Giffnock or Thornliebank. I was rather surprised to discover that it lay about a fifteen minute walk north-east of the Necropolis between the Molendinar Burn and the Monkland Canal. A William Adam, bleacher, first appears in the Glasgow directory for 1828-29 where he is found at Burnbank Bleachfield while two years later he has moved slightly west to Milnbank. This William Adam is probably the same person as the William Adam bleacher at Milnbank whose trust disposition and inventory were registered at Glasgow Sheriff Court on 22nd January 1835 suggesting he died late in 1834 and is probably the father of our William Adam buried in 1843. In the Post Office directory for 1830-31 not only is William Adam shown as located at Milnbank but the firm of William Adam and Son of Milnbank makes its first appearance. This firm can be traced in the Post Office directories at Milnbank until the last online directory of 1910-11 but I do not know what its history is after that. The Adam of Milnbank family finished up with three lairs in Kappa and two in Epsilon. There are at least thirty three members of the wider family buried or commemorated in the Necropolis between 1836 and 1968. The Necropolis was established by the Merchants House of Glasgow but there is also a Trades House which is home to the fourteen incorporated crafts of Glasgow. Like the Merchants’ House it has lost much of its original purpose but remains an important charitable organization. One of our members, who belonged to the Bonnetmakers and Dyers Incorporation, recently asked whether we knew of any members of that craft buried in the Necropolis. A quick search did not turn up anyone and it became obvious that, although many of the men buried in the Necropolis must have been members of one or other of the craft incorporations, this fact was not normally recorded on the gravestone. I did manage to identify two members of the craft by dint of checking the most prominent members of the craft like the Deacons and found Sir Matthew W Montgomery, LLD, DL, Lord Provost of Glasgow 1923-26 and Sir Andrew Hislop Pettigrew, DL, LLD of Pettigrew & Stephens of fond memory. Taken from The whole poetical works of John Wright … with a portrait of the author, and a sketch of his life, 1843. A number of early nineteenth century poets can be found in the Necropolis. Dugald Moore, William Motherwell, and Alexander Rodger are all commemorated by gravestones but John Wright was laid to rest in an unmarked Single Grave in compartment Iota on 23rd May 1844. Wright was born in Sorn parish in 1805 and moved to Galston, his father’s home town, as a young child. His formal education only amounted to a few months and he did not learn to write until in his teens. His long poem ‘The Retrospect’ was published in 1830 with the encouragement of Professor John Wilson (Christopher North of Blackwood’s Edinburgh Magazine). He married in 1832 and had several children but by 1841 he had abandoned his family. 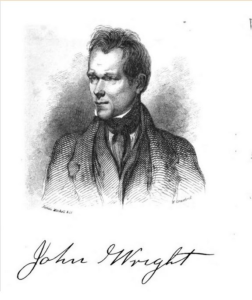 Judging by the memoir that prefaces the collection of his poems published by his friends in 1843, The whole poetical works of John Wright … with a portrait of the author, and a sketch of his life Wright may have suffered from some form of mental illness exacerbated by heavy drinking. He died from bronchitis, probably in the Royal Infirmary if we take at face value the fact that one of the men who arranged his funeral was Mr Brown of the Royal Infirmary. A new profile has been added to the website, for Humphry Ewing Crum Ewing and family buried in compartment Beta. Crum Ewing was the nephew and heir of James Ewing of Strathleven one of the founders of the Necropolis. Since Grave Matters 2 was produced indexing the burial registers has slowed a little due to various computer problems and holidays. Nonetheless there have still been a number of interesting discoveries made. In Grave Matters 1 I briefly mentioned the Egyptian Vaults (shown above before their recent restoration) in which the coffin of Major Archibald Monteath was stored until his monument was ready. The Egyptian Vaults have a T shaped groundplan with a passage leading in from the entrance and short cross passages at the inner end forming the head of the T. Looking through the gate it is possible to make out the lifting rings for the individual vaults set into the floor. From the burial registers there is evidence that there were at least nine individual vaults available though the number of the vault used is not always specified in the burial register. Between 1838 and 1843 the vaults were used 38 times. They were still in use in 1862 but I don’t yet know when their use ceased. One of the indexers was intrigued by an unusual name when he came across the burial of Alexis Snodgrass Papillon on 21st December 1842. Subsequently I referred him to the Jamieson/Papillon profile on our website for more information and he spotted a discrepancy in Alexis’s given age. The burial register records Alexis’s age as 35 while the grave stone says 33; so which is right? It is not uncommon for ages on the stone and in the burial register to vary and there can be a number of reasons why this is so. First of all it needs to be borne in mind that before 1855 there are no birth certificates as we know them; most people were baptised and their baptisms were hopefully recorded in the church’s baptismal register, and sometimes their actual date of birth might also be recorded. I do not think it was usual for most parents to obtain a copy of the baptismal entry from the minister so persons did not usually have written evidence of when they were born to allow them to calculate their age. From the Old Parish Registers for Glasgow parish we know that Alexis was baptised on 10th December 1806 which implies she was born November/December 1806 (though that may be a misleading assumption to make). However let us assume, for the sake of argument, that she was born on 9th December 1806. This would have made her 36 years and 6 days old when she died on 15th December 1842 and means that neither her age in the burial register nor her age on the stone is correct. Her burial was organized by her brother J P Jamieson and her mother was still alive in 1842, so Alexis’s date of birth and exact age ought to have been known to them. 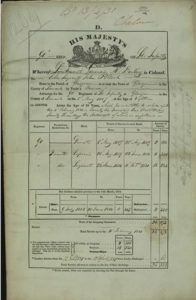 The fact that her age is a year out in the burial register suggests one of two things to me – either in the fraught days leading up to her death that year her December birthday was overlooked, or the year of her birth was misremembered and it was thought she had had her 35th birthday that year instead of her 36th. Turning to the discrepancy on the gravestone, it will be noticed that the first name on the stone is that of J P Jamieson who died in 1869. The fact that his is the first name suggests the stone was not erected until after his death. Was there a temporary grave marker there before? As Jamieson was the last surviving member of his family in Glasgow it seems likely that the stone was erected by his executors and I wonder how much they knew about his sister, who had been dead for twenty seven years? So, all in all, it doesn’t surprise me that Alexis’s age on the stone is wrong. Amongst the familiar causes of death that have been recorded a couple of more unusual ones stand out. On the 29th September 1843 William Murdoch a 20 year old tailor was buried and his cause of death was given as yellow fever. Four days later, on 3rd October the burial of another tailor, Charles Cranner, who also died of yellow fever was recorded. Considering yellow fever is a mosquito borne disease found in Central America, the Caribbean and sub-Saharan Africa the chances of William Murdoch and Charles Cranner contracting it in Glasgow seem extremely unlikely. It makes one wonder what they did die of that could be mistaken for yellow fever. Another young man who met an untimely end was William Muir a 23 year old painter who was buried on 24th March 1842. His cause of death was very informative as it said ‘accident from explosion of boiler on board Telegraph steamer at Helensburgh’. This was the second time the victim of a steam ship explosion was buried in the Necropolis. In 1835 the boiler of the Earl Grey steamer blew up when she was alongside at Greenock killing six people and severely injuring fifteen. One of the injured, Ebenezer Bell, later died from his injuries and was buried in the Necropolis. The Telegraph was a wooden paddle steamer built by Hedderwick & Rankin in 1841 for the Glasgow-Helensburgh service. She was lightly built for speed with an experimental high-pressure engine in order to compete with the railway. On the 21st March she had just disembarked some passengers at Helensburgh and was backing away from the quay to proceed to Gareloch when her boiler violently exploded. The force of the explosion completely shattered the hull and threw the engine and boiler, which were combined into one piece and weighed 8 tons, 100 feet from the ship. Sixteen people were killed immediately and about fifteen seriously injured while the final death toll reached twenty. William Muir was one of a group of six or eight painters (reports vary) travelling to Gareloch to work on the painting of a new ship launched by Hedderwick and Rankin in October 1841 called Precursor (below). Precursor was a completely different type of vessel to Telegraph, the river steamer. 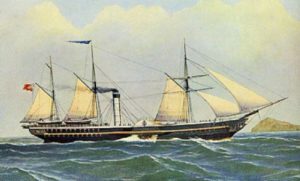 Her first owner was the Eastern Steam Navigation Co and she plied the Suez-Calcutta route until she was withdrawn in 1858. Another passenger travelling to Gareloch was Peter Hedderwick partner in Hedderwick & Rankin who also lost his life that day. I recently came across the burial of a little boy called Arthur Welesley Watson and I immediately wondered why he was named after the Duke of Wellington. Judging by young Arthur’s age at death he had been born in May 1842. By this date Wellington was an old man though he did not retire from political life until 1846 and it is difficult to imagine what caused a Glasgow father to name his son after Wellington by then. On checking the database I found we also had an Arthur Wellesley Ritchie (c1854-1879). I then started to wonder about other children with famous or unusual forenames. 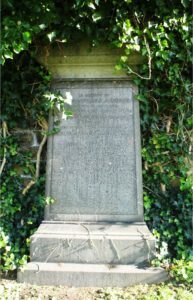 From 1851 to 1872 the minister of the Barony Church was the Rev Dr Norman Macleod and five men buried in the Necropolis bear these forenames. It is impossible to prove that they are named after the minister but both Norman Macleod Stewart (1853-1854) and Norman Macleod Crawford (1872-1873) were born during Macleod’s ministry in the Barony. One of the men for whom I feel most sorry is Primrose Bell, a Glasgow merchant who died in 1841 aged 76. It wasn’t uncommon for a younger boy in the family to be given his mother’s maiden name at baptism which is presumably what happened here. Some unusual names are also found amongst the women. In their case one finds feminized versions of male names like Angusina Margaret Mcdonald (c1905-1970) daughter of John Mcdonald and Margaret Mcleod and Gavina Norie Paterson (1861-1880) daughter of Gavin Paterson and Annie Muirhead. Girls were also given surnames as forenames. Mrs Mathieson (c1880-1918) was born Connel Mary Cargill daughter of David Cargill and Connel Auld and grand daughter of William Auld and Connel Simpson. Unusual forenames like Connel are a godsend to family historians. 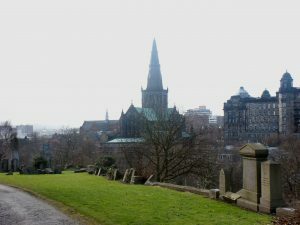 We recently received an enquiry from an author about whether it was likely that a couple who died in the 1960s would be buried in the Necropolis. Thanks to the indexer working on the 1960s burial registers I was able to reply that it was possible to be buried in the Necropolis at that period but I queried whether it was likely. 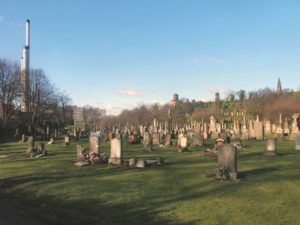 The 1960s registers normal recorded whether a burial was taking place in a newly purchased lair or not and, as the addresses of the deceased were recorded, it is possible to get a picture of who was buying a lair in the Necropolis at that time; generally it was local families from Dennistoun and Townhead. Most of the lairs sold were in compartments Quartus or Secundus both in the lower quarry area. One of our volunteers recently took a Canadian lady on a tour of the Necropolis looking in particular for any Masonic gravestones. This is not a topic about which we know very much and we would be grateful for any help in identifying possible Masonic gravestones. Some new profiles have been added to our collection: Rev Robert Cunningham (1799-1883), William Graham (1817-1885), Alexander Mackenzie (d. 1875) and his cast iron monument and Sir David Richmond (1843-1908). 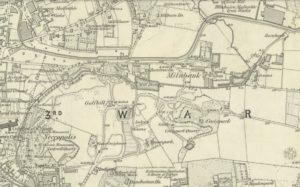 Welcome to the second edition of Grave Matters, the newsletter for those indexing the Burial Registers of the Glasgow Necropolis and other interested Friends. Many years ago when I started work on the Necropolis’s Burial Registers curiosity made me draw up a graph of annual burials in the cemetery. Below is a new version which illustrates a number of interesting points. The most striking fact is how short a time the Necropolis flourished. By 1866, when burials peaked at 1548 that year, almost half the burials to take place in the Necropolis’s 160 years lifetime had already occurred. 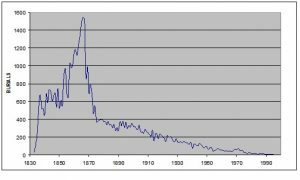 The decline in numbers after 1866 was very steep and by 1875 burials had dropped below 400 per annum and never recovered. Sixty years later burials were below 200 per annum and by 1950 they were below 100 per annum. In the last year for which I have figures (1995) there were only 9. 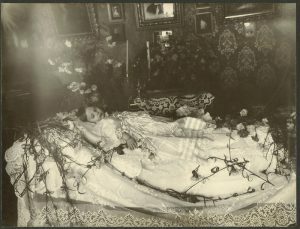 One of the most interesting pieces of information found in the early Burial Registers is the cause of death of the deceased person. There was no obligation to record it but it is found in the Burial Registers until the end of 1854, ceasing when civil registration of births, marriages and deaths started, in Scotland, on 1st January 1855. The causes of death given in the Burial Registers have not been certified by medical practitioners unlike those on modern death certificates and some of them may seem rather odd to us. Sometimes a symptom like ‘fever’ is given as the cause of death. Many of the common infectious diseases are to be found, cholera, measles, hooping cough (note the spelling), scarlet fever, typhus, typhus fever, and many, but by no means all, victims are children. 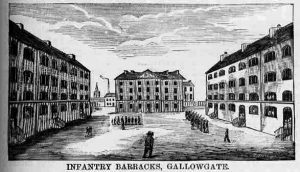 Between 26th January and 22nd March 1834 there was an outbreak of measles in the married quarters of the Infantry Barracks in the Gallowgate during which ten children died. The ages of the children ranged from 6 months to 13 years most being under five. The first death was that of Martha Clark, daughter of Sergeant James Clark of the 82nd Regiment of Foot. In the next fortnight two of Martha’s sisters died and one brother, all from measles. All four were buried in the Single Grave Delta 1 which was in use at that time. Later in February Private James Rynalds, also 82nd Foot, and his wife lost two daughters in the outbreak. there are other examples of couples losing multiple pregnancies. Premature birth was particularly dangerous for twins; David Law and his wife lost twin daughters at 2 days in 1846 and Archibald Watson and his wife’s twin daughters only survived for one and two days respectively in 1837. The Watson twins are named as Jane and Elizabeth but the Law daughters are unnamed in the burial register. I wonder whether this implies Jane and Elizabeth had been hurriedly baptised before their premature deaths and the Law girls had not. In Grave Matters No 1 I mentioned that one of the burials from 1842 added to the database was that of a still born son of Mr Schwabe in the Jews’ Burial Ground (Alpha 1). It turned out that Mr M H Schwabe had already buried three children in the preceding years (1836-1838). On further investigation a Schwabe stone was discovered in compartment Epsilon. Unfortunately this stone is very badly eroded and the transcribers from the Glasgow & West of Scotland FHS were unable to obtain any information from it. It may be that they were working from a photograph of the stone and it would probably be useful to examine the actual stone to see if anything can be made out. The whole stone seems to have been inscribed including the base. THE Late Mrs H. L. SCHWABE — The grave closed yesterday in our Necropolis over the mortal remains of a lady who some years ago occupied a prominent position in this city on account of her benevolence and of the interest she took in all that was good and noble. Mrs H. L. Schwabe about fifty years ago, was one of the first German ladies who left her native country with her husband to settle in Glasgow. By her high character, refined manners, and agreeable presence, she soon won the esteem of all who became acquainted with her, and her home circle was soon increased by men and women of intellect and position. Her house became the centre to which her countrymen were attracted, and an introduction to which was a voucher for their respectability and intelligence, but it was also open for any one who required advice or a helping band for any good purpose. She gave where she could, but not only with her hands, her heart was in her work, and no fatigue was too much for her in carrying out her good intentions. She was an active promoter of several educational and benevolent institutions. She took an active interest in the Queen’s College for the Education of Young Ladies, and, assisted by the late Mr Robt. Dalglish, Mr Walter Crum, and other leading citizens, she established a public nursery, likely the first of its kind in Glasgow, where little children could be left under proper care while their mothers were employed in warehouses and works. After the death of her much-beloved husband, who had seconded her in her noble efforts, she removed to Edinburgh, where her daughters follow the good example set by their parents. The eldest is the wife of Lord MacLaren and the younger one one of the secretaries of the Society for the Higher Education of Women. Mrs Schwabe will long be remembered by all who knew her as one who not only aspired to higher aims, but also inspired others with the same feeling. The funeral service was conducted by the Rev. Dr Crosskey, of Birmingham. Glasgow Herald (Glasgow, Scotland), Tuesday, June 19, 1883; Issue 146. One of the indexers is working on the later burial registers from the 1950s onwards and there are some interesting points of contrast with the earlier registers. Firstly, as mentioned above, the number of burials each year is very much reduced even though new lairs are still being sold in the 1960s. Secondly the vast majority of those buried are aged over 50 and so far no children or teenagers have been buried, and thirdly those between the ages of 20 and 50 are made up almost entirely of the victims of the Cheapside and Kilbirnie Street fires in 1960 and 1972 respectively. The type of information given in the modern registers is somewhat different from the earlier ones. It is nearly always impossible to tell whether a woman is married or not as ‘Mrs’ is not used as a prefix and husbands are not identified as happened in the nineteenth century. Another loss is that no occupations are given for the men. The major change is that addresses are now recorded and I recognised quite a few from the Springburn/Townhead area – Glebe Street, Grafton Square, John Knox Street, Edgefauld Road, Bedlay Street, Onslow Drive are just a few. There are addresses too from outside the city like Bearsden, Clarkston, Newton Mearns and further afield to Ayr, Largs, Helensburgh and even Bexhill-on-Sea and Bournemouth. 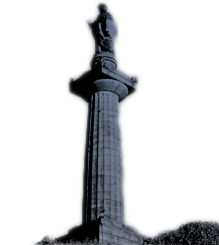 Five Friends of the Glasgow Necropolis are now engaged in the massive task of indexing the burial registers from 1842 to 1995 (eventually). This covers approximately 1700 pages and comprises approximately 48000 names. In the first month (October) c220 records have either been added from scratch or expanded. It seemed to me that it might be interesting to mention some of the discoveries that are already being made and discuss a few of the queries that have been raised as the indexers familiarise themselves with the task ahead. One of the most striking things about the early burial registers is the number of burials which occurred in Single Graves, more usually referred to elsewhere as common graves. In the early years of the Necropolis roughly two thirds of interments were in Single Graves. Between 1833 and 1842 this means that 2625 out of 3878 persons were buried in single Graves and, as a result, are not commemorated on a grave stone. It will be very interesting to see what the final total for burials in Single Graves is by the time they are phased out in 1872. I wonder whether the final figure might be 8000 – 9000 but whatever it turns out to be it is so important to remember that none of these persons have any sort of commemorative stone in the Necropolis and are completely overlooked by visitors to the cemetery. In fact we are not even sure where the Single Graves are. We know, from the burial registers, that there are Single Graves in most of the early compartments opened in the Necropolis but we don’t know exactly where. Two years ago the Friends managed to raise money which allowed some geophysical surveys to be carried out within the most likely areas but the results were inconclusive and we are no further forward. Amongst the interments that occurred in 1842 was that of Major Archibald Douglas Monteath on 21st June 1842. This page is very faint and certain details have been redone in a different hand so it is definite that Major Archie was buried in Upsilon 2; but the Egyptian Vault is also recorded as his place of burial. This was a vault used for the temporary storage of coffins until a permanent place of burial had been prepared which sometimes involved excavations and/or building work. Major Archie was unmarried and had more money than sense. 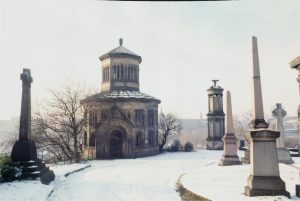 He left £5000 for the construction of his monument and has bequeathed to us the Monteath Mausoleum one of the most iconic monuments in the Necropolis. Another entry found was for the 17th burial, the stillborn son of Mr Schwabe, in what is described as the Jews Ground (also numbered Alpha 1). 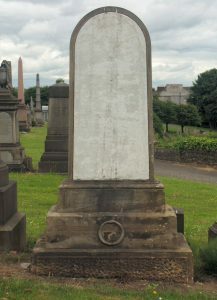 The Jewish community in Glasgow purchased a piece of ground in the Necropolis from the Merchants’ House and the first entry in the burial register, on 12th September 1832, is that of Joseph Levi, jeweller in Alpha 1. 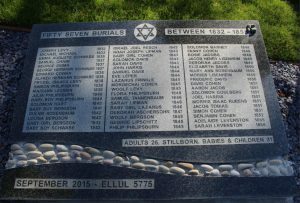 In 2015 funds were obtained for the renovation of the Jewish Burial Ground and a memorial stone to the 57 persons buried there was unveiled (below). I myself am not transcribing the burial registers in the same manner as the rest of the volunteers. Instead I am making use of my access to the registers to try and fill in some gaps that exist in the database. I have been aware for many years that when the original Wellington Street UP Church was sold and demolished the bodies buried in the crypt were removed to the Necropolis and reburied in a large plot in compartment Alpha. It turns out that the burial registers record the number of coffins from Wellington Street Church reburied in each of 120 new graves within Alpha 85 in the Necropolis in 1879. I calculate that a minimum of 708 bodies were removed and reinterred. None of these people are identifiable unless a stone was subsequently erected on the new grave which named them. In a small number of cases burials continued in these graves but this soon ceased. As I gaze through the Bishop’s window. Victorian grandeur descends into disrepair. In the mist, falling leaves temper morning’s air. Chaffinches rise and fall in undulating flight. Cathedral spires glow in autumn’s gilded light. To the west lies the crag and tail. Down by the Drygate, seek the Druids trail. Among the elm and willows, the silent rest on earthen pillows. Why only the living, swarm upon the city of the dead. A placid angel bows its immortal head. We’ve added a Chinese translation to the History section of our website. Thanks to Chi Kam for translating this for us and for translating on the Tour of the Glasgow Necropolis for the delegation from Dalian, China, one of Glasgow’s twin cities – and one of the first. 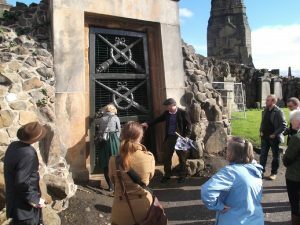 The Friends of Glasgow Necropolis is bidding to bag a massive cash boost from the Tesco Bags of Help initiative. Tesco teamed up with Groundwork to launch its community funding scheme, which sees grants of £5,000, £2,000 and £1,000 – all raised from the 5p bag levy – being awarded to local community projects. greenspace scotland is working with Groundwork to provide support to communities in Scotland. 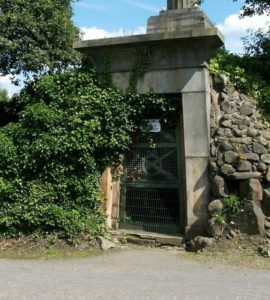 The Friends of Glasgow Necropolis is one of the groups on the shortlist and are raising funds for path improvements within the Glasgow Necropolis. Tesco’s Bags of Help project has already delivered over £27 million to more than 3,500 projects up and down the UK. Tesco customers get the chance to vote for three different groups every time they shop. Every other month, when votes are collected, three groups in each of Tesco’s regions will be awarded funding. · The Bags of Help initiative is supported by money from the five pence charge levied on single-use carrier bags in Tesco stores. · So far Bags of Help has awarded over £27 million to more than 3,500 local community projects.